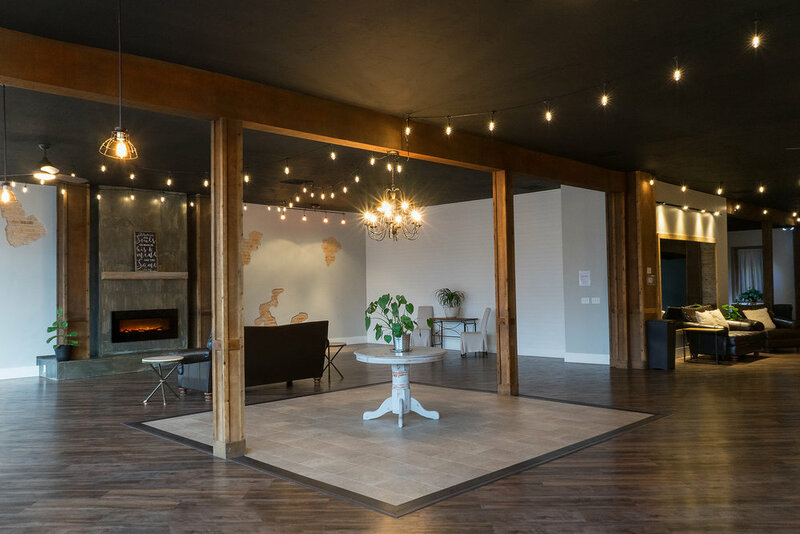 Most often used for weddings & receptions, our largest space (5,500 square feet) is picture perfect with exposed brick original to our historic building & unique features and vignettes like cedar, metal, and shiplap. The on-trend style of the 'Venue Studio' will help make your event Pinterest worthy! But the best part? Our space is comfortable and sociable, so time spent with guests at your event will be memorable and care-free! It's the perfect place to gather and celebrate life's greatest milestones. Because the 'Venue Studio' is beautiful to begin with, very little is needed to create a classic and personal atmosphere that reflects your style. The neutral canvas of our space pairs well with any decor or color pallet. More details about this studio as well as rental options and pricing can be found below. Also, text for any additional questions or to set-up a tour. alcohol can be brought in for an additional fee but must be served (not sold.) No cash bars. Beverages must be monitored if minors are present. Weekend events (booked on a Friday or Saturday) as well as weddings (can be booked on any day except Sunday) fall under our "day rate" event pricing. Weddings booked on a Saturday receive a 12 hour block of time for $1200. Weddings booked on a Friday receive a 12 hour block of time for $1000. Monday through Thursday events and weddings receive a 12 hour block of time for $750. Friday and Saturday rentals at the 'Venue Studio' are not eligible for hourly rates, only day rates apply. Deposit: 50% of your rental fee is due at the time of booking to secure your date and is non-refundable in the event of cancelation but does apply to your total. The remaining 50% is due 30 days before your event and will be sent to you via email, along with any add-on's you choose. Contact us to check the availability of your date via phone or text at before you fill out the booking agreement. Birthday parties, bridal and baby showers, anniversary parties, graduation celebrations, prom dinners, Quinceañeras and workshops, can take advantage of our hourly rates Monday - Thursday. Event rental rates apply to any type of Wedding event or rental on the weekend (see pricing above.) All events booked by the hour fall under our $75 per our pricing structure. Photoshoots, styled shoots and classes can book the 'Venue Studio' on an hourly basis for $40 per hour (up to 4 hours.) For additional hours, check out our punch-pass or membership options for amazing discounts and perks.